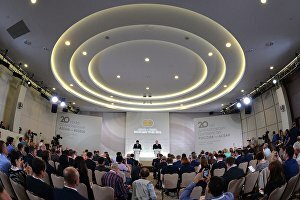 Vladimir Putin and Prime Minister of the Lao People's Democratic Republic and Chairman of the Association of Southeast Asian Nations Thongloun Sisoulith made press statements and answered journalists' questions. Russia and ASEAN are marking the 20th anniversary of their dialogue partnership this year. This anniversary is a good opportunity to look back over what we have accomplished up until now and outline the steps for taking our cooperation further. This was the objective of all the programme events of the summit that has just ended. Let me say that this summit took place in the spirit of friendship and mutual understanding that characterises our relations with our ASEAN partners. Our discussions brought us to the common conclusion that Russia and ASEAN have achieved some solid results over these last two decades in a wide range of areas. Most importantly, we have reached agreements on building a strategic partnership over the long term. This objective is set out in the Sochi Declaration, adopted at the summit, in the roadmap for developing our relations, and in the 2016-2020 Comprehensive Action Plan. The recommendations formulated for the Sochi summit by the Group of Eminent Persons, composed of people from Russian and ASEAN diplomatic services and academic communities, will be very useful in this regard. We agreed at the summit to develop our cooperation in the political sphere. Our countries will continue to work closely together in the UN, APEC, and the G20. We will continue to strengthen our cooperation with a view to developing a reliable and open security architecture for the Asia-Pacific region. Our work together at the East Asian summit, the Regional Security Forum, the defence ministers' meeting and other organisations working under ASEAN aegis pursues this same objective. We will continue our cooperation in fighting international terrorism, trans-national crime and drug trafficking. We have agreed to expand the practice of holding annual courses organised by Russia's Federal Security Service for colleagues from ASEAN countries and will also expand our partnership ties between Russia's Interior Ministry and the Association of National Police Forces of the ASEAN region. The economy was a particular focus of attention at this summit. Russia's trade with ASEAN countries came to $13.7 billion last year and our total capital investment came to $11 billion. But these figures do not reflect our countries' real potential, and so our partners supported the proposal to increase our mutual trade, investment and technology ties. We are committed to developing the infrastructure for Russia-ASEAN cooperation. Over this last month alone we have established several new cooperation mechanisms, including in agriculture and education. The first informal meeting of our defence ministers took place, and we reached agreements on stepping up cooperation on emergency response to and combating infectious diseases. We have launched dialogue at the ministerial level in the culture sector and have also organised our first joint arts festival. On the plans for this year are the first meeting of our transport ministers in Moscow, a youth summit in Cambodia, and the universities' forum in Vladivostok. Russia and ASEAN share a desire to play an active part in regional economic integration processes. Let me remind you that the Eurasian Economic Union signed a free trade zone agreement with Vietnam last year. We are studying the possibility of concluding similar agreements with other ASEAN countries — Singapore, Cambodia, Thailand, and Indonesia. At this summit, we proposed that our ASEAN partners reflect on the establishment of a comprehensive free trade zone between the Eurasian Economic Union and ASEAN, and at the working breakfast, we exchanged views on how we could develop links between the integration processes underway in the Asia-Pacific region and in the Eurasian region. Let me note that all these ideas have received considerable support from the Russian and ASEAN business communities. We had further evidence of this today at the meeting with participants in what was the biggest Business Forum event in our history so far. This was a constructive, concrete and useful discussion. The business community representatives assessed highly the prospects for developing closer ties between the Eurasian Economic Union and ASEAN countries and for intensifying business contacts. Before the summit began, you know that I met in Sochi with the President of Indonesia, Mr Widodo, who is in Russia on an official visit, and I met with leaders from other ASEAN countries too. I want to say that all of these talks were frank and substantial and reflected a shared desire to develop mutually advantageous ties between Russia and ASEAN countries in all areas. Let me conclude by thanking Prime Minister of Laos, Mr Sisoulith, as the current ASEAN Chairman, and all of the delegation heads and the ASEAN Secretary-General for their great contribution to this summit's success. 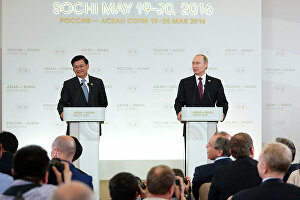 Prime Minister of the Lao People's Democratic Republic and Chairman of the Association of Southeast Asian Nations (ASEAN) Thongloun Sisoulith: President Putin, representatives of the media, it is my privilege and great honour to co-chair with President Putin the ASEAN-Russia Summit today to mark the 20th anniversary of ASEAN-Russia dialogue in the beautiful city of Sochi. I concur with President Putin that today's commemorative summit marks a historical milestone in the ASEAN-Russia dialogue relations. We express our satisfaction with the significant progress achieved over the last two decades in many areas across the political, security, economic, social and cultural dimensions. We discussed and charted our key directions to further strengthen our cooperation to work at getting the ASEAN-Russia relations to a strategic level and at efforts to promote peace, enduring stability and prosperity for our peoples in the future. More importantly at this summit we adopted the Sochi Declaration and the Comprehensive Plan for Action in 2016-2020, and the report of the ASEAN-Russia Eminent Persons Group. These documents are important for further broadening and deepening of the cooperation and partnership between ASEAN and Russia in the future. In 2016, Laos is not only chair of ASEAN but also the country coordinator for ASEAN-Russia dialogue relations for 2015-2018. We therefore stand ready to work closely with ASEAN member states and Russia to effectively translate the outcome of today's summit into tangible results. Question: I have a question for both leaders. There was broad discussion today of Russia's initiative to establish a trilateral economic partnership between the Eurasian Union, the Shanghai Cooperation Organisation and ASEAN. What would be the first steps on this road? Where will you start? Do ASEAN countries have a unanimous position on this proposal? Do we know what position our SCO partner, China, takes on this initiative? And a question for the Prime Minister of Laos: What steps is ASEAN ready to take for starting work on building a trilateral or some other format integration arrangement of this sort? Thank you. Vladimir Putin: Let me try to answer this question. All participants in today's meeting expressed unanimous support for this idea. We need to unite the different integration organisations' efforts, in the areas where this is possible at least, in order to avoid duplication, parallel work, and generally create a better climate for business development. This is a complex process and involves very detailed talks not just with each country but also on the different categories of goods. We are fully aware of the work involved, but, like our partners, we think this is the right road to take. We will not try to hasten things, but will calmly examine the possibilities for making progress in this direction. As for our Chinese friends, we will need to discuss this matter with them, but overall, we know their position. The Silk Road Economic Belt idea is close in spirit to the proposals we discussed today. I therefore see no contradictions here. On the contrary, knowing China's position on forging links between the Silk Road Economic Belt project and the Eurasian Economic Union, we see that all of our plans in this respect tend towards the same objective, and so we are sure that there will be positive work together. Thongloun Sisoulith: I support President Putin's position. Question: I have a question both for the President of Russia and for the Prime Minister of Laos. What is the status of security issues in Russia's relations with ASEAN countries? Could you compare the share of security issues to the share of economic ones? Thank you. Vladimir Putin: You know, it is difficult for me to talk in terms of shares. Let's not compare them in percentages — how much for the economy and how much for security, social or cultural issues. All of this was addressed in the context that we should work in all areas. However, security issues, without a doubt, are among the most important issues, an important component of our interaction. Practically all our colleagues, all without exception, expressed concern over the threats posed by international terrorism and cross-border crime, and all of them firmly supported the idea of pooling our efforts in fighting this evil. We know that in the not so distant past, the countries of the region themselves were affected by these problems and sustained serious damage, and naturally, all of them want stability and peaceful development. Not surprisingly, we have reached an agreement, and first consultations at the level of defence ministers have already taken place. I am sure that this cooperation will continue, as will military-technical cooperation between Russia and ASEAN countries. Thongloun Sisoulith (retranslated): I would like to add something to what President Putin has just said. In addition to multilateral cooperation, as well as cooperation between Russia and ASEAN member countries, which is very important, ASEAN countries also attach great importance to Russia's role in maintaining international peace and security. These issues are also addressed within the framework of our interaction with the EAEU. We also discuss economic, trade and investment cooperation issues. Today, President Putin organised a working breakfast where we had an opportunity to discuss ways of furthering our interaction with the Eurasian Economic Union and the Shanghai Cooperation Organisation. I believe that these discussions have produced excellent results. Of course, a substantive dialogue on these issues should continue in the future. Question: I have a question that is related to security issues. Summer, and vacation season, is just around the corner, but the terrorist situation in the Middle East is getting worse. The destruction of the Egyptian airliner yesterday, confrontation with Turkey: all of that will certainly affect outbound tourism. In this connection, were any measures discussed to ensure the availability of ASEAN resorts, and which countries are interested in this? Did any country show interest? Thank you. Vladimir Putin: First, I hope that the situation in those countries where Russians traditionally go for vacation will get back to normal. Once again, we extend our condolences to the families of the victims, the people of France and Egypt, in connection with the crash of the Egyptian aircraft over the Mediterranean Sea. We do not oppose anything, nothing, and we do not pit anyone against anybody. However, the development of tourism between Russia and ASEAN countries is, of course, discussed. It has always been discussed, and it was discussed at this summit, too. Almost all ASEAN countries are interested in receiving Russian tourists. It was discussed in the context of facilitating visa regulations. With some countries, such as Thailand and Vietnam, we have signed an agreement for visa-free stay for 30 days. We are discussing these issues with other countries. We talked about the need to establish direct air communication between Russia's major cities and holiday destinations in ASEAN countries. Yes, this issue is being discussed, and I hope that soon, Russian citizens will be able to vacation throughout the world, including in ASEAN countries, which boast many good resorts. These countries have good climates, so there are lots of possibilities. Question: Mr President, your recent meeting with your Japanese colleague Shinzo Abe prompted speculation that the continuation of the dialogue on the territorial issue was Russia attempting to gain leverage to sell our islands at the highest possible price. We know that it was a long meeting. Would you say that you succeeded in keeping the topics separate — trade and economic partnership separate from the territorial issue; that there is no connection between the two, and they are discussed separately? Another question is to you, Mr Prime Minister. There were reports that it was suggested before the summit by other countries, mainly Western ones, to you, to Laos as the ASEAN Chair, and to other countries that they should refrain from visiting Russia and not hold this summit. Was that so? If it was, why did you choose to come and hold this summit in our country? Thank you. Vladimir Putin: As for our relations with Japan and your assumption that we are out to sell something at the highest possible price, we are not selling anything. We are willing to buy many things but we are not selling anything. However, we are ready and willing to have a dialogue with all our partners, Japan included, particularly on concluding the peace treaty, in the context of which we discuss the territorial issue. We do not link the two. We are simply hoping and, I reiterate, determined to develop relations, including with Japan, which we regard as an essential partner in the Asia-Pacific region and in the world. Japan is our neighbour, and we have attained a high level of relations. We do not link anything. We discuss all options and areas of cooperation — the economy, culture, sport and the peace treaty — but we do not link any of them. While our contacts have been limited of late, that is not the result of our policy. We are open and ready to work. Thongloun Sisoulith: I would like to say that, as the ASEAN Chair, we were not pressured by any third parties to refrain from participating in this summit or to prevent it from happening altogether, especially because it was convened for a reason of great importance, the 20th anniversary of our dialogue partnership. Cooperation with Russia is essential to us. As we celebrate the 20th anniversary of our relations, all ASEAN member countries share the opinion that the Sochi summit should be held. That is all I can say on this score. Question: Are there any plans to ensure that more countries participate in the ASEAN-Russia summit? For example, countries of the Middle East, or other countries? Thank you. Vladimir Putin: Naturally, we have long-standing and deep-seated relations with the countries of the Middle East, with practically all countries of the region. We work both in multilateral and bilateral formats. I see no problems here. It is simply that the countries of the region you have just mentioned are not part of ASEAN. Our meeting was devoted to the development of Russia's relations with ASEAN member countries over the past 20 years, butwe have always had, and continue to have, very good relations with the Middle East. I do not know of a single country in the Middle East with which we would not be in contact, with which we would not be developing our relations. As was stated earlier, and this point was also made at our meeting, at this news conference, unfortunately, the region has fallen on hard times. There are a lot of problems and there is a relentless fight against terrorist organisations. You know our position on these issues and I know the position of all leaders of the Middle Eastern countries. All of them are ready to fight terrorism and are in fact fighting it. As the leader of one country said, "We Islamic, Muslim countries are the first victims of the terrorist threat and we want and we are ready to join forces with Russia in this fight." We are also ready and we are doing so. Question: I have a question for the Russian President. Mr President, here in Sochi, in the winter of 2014, Russian Olympic athletes scored spectacular victories. Today, new allegations are being made in the West against Russian athletes over the abuse of banned substances. WADA has announced a follow-up test of samples. What is your position on this? Vladimir Putin: Positive. I believe that if there are any doubts they should be eliminated. You know our position, not only my position, but also the position of the Russian government and all athletes: sport should free of any doping. It should be honest. Competition should be honest. Only then will it be of interest both to the athletes themselves and to millions of fans and spectators. Having said this, of course, this campaign is proceeding amid politically motivated restrictions with regard to our country, to Russia, but I hope that WADA's actions are not in any way related to this. You also heard that Russia's Investigative Committee and the Prosecutor General's Office have announced that they will conduct a thorough investigation into everything that we are seeing and hearing in the media. We are not ignoring this. We are ready to cooperate and, in addition, I have already directed the Ministry of Sport and all Russian agencies and organisations to provide all necessary assistance to WADA inspectors in their work. Question: I have two questions. One is for the President, the other is for the Prime Minister. First, Mr President, you have held a series of meetings with the ASEAN leaders. Did you find understanding on all issues, or were there differences? Vladimir Putin: No, there were no differences. We completely understand the challenges that we are facing, and their solutions. We discussed specific issues. You know, I enjoyed this meeting. On the face of it, it's a celebration — we got together to mark the 20th anniversary of our cooperation. However, this meeting was also productive, and I reiterate, very specific, because we discussed specific areas of cooperation, and even more — specific projects, because we have long-standing economic, cultural and political ties with many countries. We discussed specific areas of our joint work, and we had things to discuss with each country. This meeting was productive, and I want to thank the Prime Minister again for facilitating this meeting. I hope that this is not our last meeting in this format and that we will continue to work together with all our partners. Question: Thank you. Mr Prime Minister, do you agree with the idea that this summit will open a new chapter in relations between Russia and ASEAN? Thank you. Thongloun Sisoulith: You know, this is not the first anniversary summit. The last one was held on the occasion of the 15th anniversary of our cooperation. But the 20th anniversary is even more important for us, because it allows us to evaluate progress in our relations. 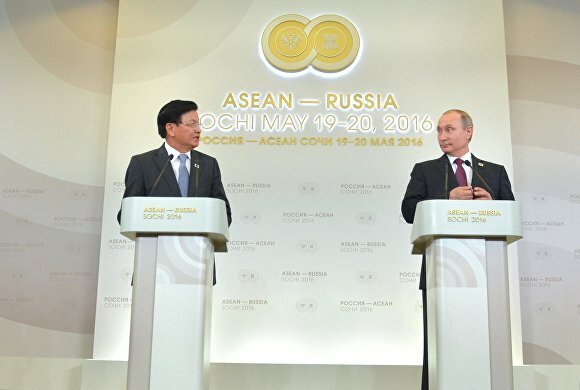 ASEAN and Russia cooperate closely in order to maintain international and regional peace, prosperity and stability. That is why this summit is a landmark of our relations. Vladimir Putin: Thank you for your interest in our work.